Former old bakery recently converted into two superb flats situated on Pittenweem Shore by the Harbour in the historic picturesque East Neuk of Fife. Pittenweem is 10 miles from St Andrews and approx 50 miles from Edinburgh. The Flour Loft at No 8 East Shore has 3 bedrooms (1 Double and 2 Twin) all with en suite bath/shower rooms. 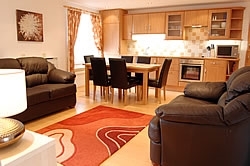 The open plan living/dining/kitchen area is well furnished and fitted out with washer and dryer, fridge and freezer, dishwasher, electric cooker, microwave etc. 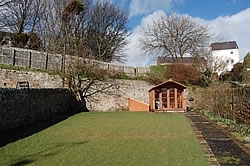 The Hay Loft at No 9 East Shore has 1 twin bedroom with en suite bathroom and the open plan living/dining/kitchen area is also well furnished and fitted out with washer/dryer, fridge and freezer, dishwasher, electric cooker and microwave etc. In the living area there is a comfortable sofa bed and in the hallway a downstairs toilet. 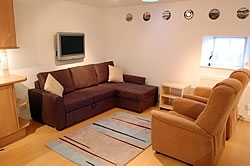 Both flats have flat screen TVs with Freeview in the living areas and also in the bedrooms. To the rear of the property there is a shared garden with a seating area which looks out over the sea. 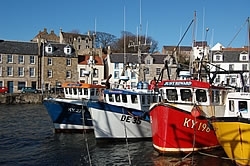 You will enjoy watching the fishing boats going out and coming back with their catches, exploring the Coastal Path and beaches, maybe going on a boat trip to the May Island, visiting the Scottish Fisheries Museum in Anstruther and eating out in the many good restaurants and pubs in the area. The East Neuk of Fife is a picturesque area, an artist's paradise. If you are a golfer you will also be in paradise playing all the good golf courses nearby and of course the famous Old Course in St Andrews. You will enjoy just being here in the East Neuk absorbing the ambience of the place.